Happy Friday Follow! I am a new follower! My blogs are numbers 166, 167 and 169! I have an alarm clock set just in case, but I almost always wake up before it goes off. My kids set their own alarms, but still depend on me to come in and make sure they are up. I set my alarm about 20 minutes before we HAVE TO get up. Then I snooze for the next 20 minutes... hahaha! I don't have anytime that I have to be up-Evan usually wakes up before Isabella and comes and crawls in bed with me. It's definitely an alarm clock.....well except for every other Sunday when I am off. I wake up on my own. I have since I was very young - I've always been a morning person. except if i have to do something or go somewhere, i have a 3-year old toddler, barefoot and pregnant, stay-at-home wife and mom, i really don't find any reason to use an alarm clock. Does a crying baby count as an alarm clock? Already following. I do have an alarm clock, although often times I seem to wake up just before it is due to go off. On school days I wake up to an alarm, but most of the time I get up before it goes off. On Mondays and Fridays I pretty much sleep until my girls get up. my kids wake up on their own and then they wake me up. If I have somewhere to go then I use the alarm. Currently I don't use an alarm clock but if I really need to get up early I set the alarm on my cell phone. My 13 year old daughter has her own alarm clock. If she didn't she'd probably sleep in and I would end up being her alarm clock! My kids are my alarm clock. If someone has been nice enough to keep them overnight, I have to set an alarm otherwise I think I would sleep all day! I set an alarm but I usually wake up five minutes before it goes off. My children all have their own alarm clocks but they usually sleep through them and I have to wake them up anyway. If I don't they miss the bus and then I have to drive them. When the sun rises earlier I won't need an alarm at all. I won't be able to sleep past 5 am. I usually wake up on my own. Unless I'm really tired, then my crying toddler will usually wake me. My kids usually wake me up. 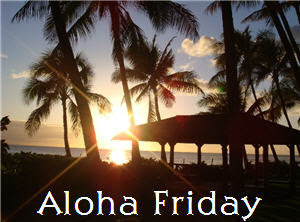 Happy Friday Follow and Aloha Friday (better late than never)! We all have our own alarm clocks set at different times. Hubby usually gets up before I do and I get up on my own. The alarm clock for me is back up.